If you have tried some baking recipes, you would be aware that a lot of these recipes say that you need to use butter at room temperature. What does that mean? Why can't we use cold or warm butter? Initially, I assumed recipes asked for butter at room temperature because it would be easy to use it in the recipe as compared to a hard stick that could not be beaten. So I warmed up my butter in the microwave for a minute and used the almost liquid state I got. But my recipes would not turn out as great as I hoped. So I tried using actual room temperature butter, and the result was noticeably different (better)! Why do You Need Butter at Room Temp? When you beat soft butter along with sugar, the jagged ends of cugar cubes make tiny little holes in the butter and air creeps in. The air that is filled into your dough/batter while beating soft butter and sugar, converts into light and fluffy end products! How to Get Butter at Room Temp Quickly? 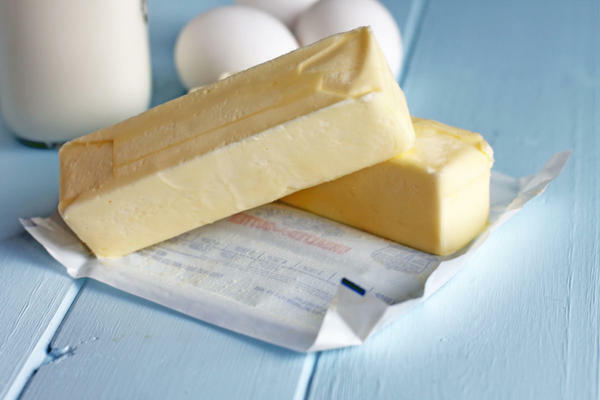 If you wish to get started on your recipe quickly, but the butter is sitting hard in your fridge, here's a trick. Cut the required amount of butter into pieces and place them in a heap in the center of a plate. Now fill up a glass with water, microwave it for 90 seconds. Throw out the hot water and quickly place the inverted glass over the heap of butter in your place. You will find that the butter will soften up quickly without actually melting!